I have two 11 month old male cocker spaniels from the same litter. Buster is extremely outgoing, confident, loving and laid back. Max is a little smaller, afraid of every new thing he encounters and very possessive over anything he places a high value on. Lately, he has started growling and snarling when pressed to relinquish anything he shouldn't have. Max has been known to attack his brother Buster as well. We love Max, but I am becoming uneasy with him and have started determining whether getting Max's possession away from him is worth the battle or have even resorted to removing Buster and myself from the area and left Max alone until he calms down. Sometimes leaving Max alone will result in Max leaving the article, and returning to a normal disposition and sometimes Max is still angry and will grab a hold of Buster's ear in retaliation or continue to growl when approached. 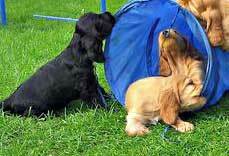 I am working with both dogs each evening teaching them tricks and am currently teaching sit and stay. We have a large yard they play in daily if weather permits, so I am relatively sure Max is getting the exercise he needs to relieve pent up energy. We also experience negative responses from Max with eating. He is not food driven and sometimes must be coaxed to eat his meals or hand fed a few bites before he will continue on his own. For the most part Max is very attentive and grasps most ideas of what you are asking very quickly and can be very loving and snugly. This aggressive behavior is just unnerving. I am looking for suggestions on how to help Max overcome this and am wondering how we caused him to become this way? Oh dear, it sounds like you have your hands full with Max, doesn't it? Raising two puppies at the same time, especially from the same litter, will be difficult during the first 12 to 18 months and will present you with many 'challenges' - as I think you're beginning to see. There are some things that you can do to help, as set out below. The main thing is to give each puppy time on their own. It's important that you give them time to develop their own personalities (and not allow one or other to dominate) and have their own 'special' time with you. It's also very difficult when training and socializing two puppies, for each puppy to concentrate solely on you and the training. It's likely that they'll behave like naughty little boys and/or want to play. My first priority would be to teach Max to 'Leave It' and to 'Drop It' - you will find this page very helpful, simply scroll down to the relevant sections and follow the link to each article. Once you've mastered these commands, it should be much easier to get him to leave things he shouldn't have. In the meanwhile, I recommend you keep some chopped, cooked liver in the fridge and if Max won't release something, offer him a small piece as a 'trade-off'. He may not be food driven, but I've yet to meet a dog that doesn't like liver! I believe dogs need a change of scenery; different sniffs and sights, and I also think they need to feel the sense of 'migration' that they get with a walk. It's also a great opportunity to teach them how to walk on a lead - without pulling. I recommend beginning with a 30 minute walk during the day and work up to an hour from there. I really wouldn't rely on the puppies getting their exercise just from being in the yard. If you do this every day, you may just see an improvement from this alone. Never feed them together, feed them in separate rooms. This will help prevent food aggression arising because one puppy finishes his food before the other and tries to get at his siblings food. I recommend you socialize them separately. It sounds like Max could do with additional socialization training. If you need to take them to the vets, for example, for vaccinations, take them separately. The same applies with training, playing, and exercising - all these activities need to be done separately. In short, treat them as individual puppies. I'm not saying that your puppies can never do things together, they can, but it must be in addition to their individual training. You might like to read this article - it will give you a fuller understanding of the problems associated with raising two puppies in the same household, and what you can do to help. I hope this helps Laurie. We have a 14 week old Cocker who is amazing at basic commands, such as sit & retrieve. He's also great on the whistle. The problem I have is that he is very aggressive at play. I have a 5 year old Springer, who is a gentle giant, but naughty Hector is up at his face all the time. He bites and nips his face and legs. My Springer is not aggressive at all, but I'm worried for both of them. I need to stop this aggressive play in Hector & I don't want Hamish to become aggressive. Any helpful hints would be most grateful. You're very welcome - I hope it helps and you have success. Thank you so much for the links and words of advice. We will take all to heart. Max is such a sweet dog 90% of the time. The 10% is where we need to focus to help Max grow into a happy, well behaved dog.